This continues the updates from my blog of 2017-04-21. Last night was the fifth of May, and I made several important changes to the circuit. I was finding that after adjusting the 8 to 50 pF N150 ceramic variable capacitor, the frequency would drift for hours, then overnight the drift would settle down to a low level, until I adjusted the capacitor again. I think this capacitor may be wearing out, so I removed it. I put two capacitors in series to get the frequency back down but these were only 18 pF, so I removed one turn from the core, leaving 9 turns. I then changed the parallel capacitors to get the frequency down to 27.145 MHz. I also added a 0.2 to 5 pF variable capacitor in parallel to give a small amount of adjustment. Once I adjusted it to the correct frequency, the drift was much less than before, the oscillator stayed on the correct frequency overnight. Now this Vackar oscillator is doing what Vackar oscillators are supposed to do: be very stable and not drift and stay on frequency. It’s May 6 and I left the oscillator running on the shelf all day. The frequency has been very stable as long as I don’t move it or put something near it. I think it has drifted only a few hundred hertz since yesterday. Once I got rid of that 8 to 50 pF ceramic variable capacitor, it has been solid as a rock. It’s hard to believe how much difference the right capacitors make. I wound another T37-7 core with 9 turns of solid PVC insulated telephone wire and measured it at 350 nH, but cores may vary by as much as 20% from core to core. I can say that the one in the oscillator is under 400 nH. The circuit needs to be built on a PC board with a ground plane to provide shielding. Also it should have a varicap and potentiometer to adjust the frequency. The whole circuit should be in a metal case. It might be okay to put it inside an Altoids tin. Also a buffer stage should be added so the oscillator will be isolated from external influences. The buffer stage should be Amplitude modulated so it can be heard on the receiver. This afternoon I was reading about Vackar oscillators and I found different documents with somewhat different parts values and ratios. The circuit is a type of Colpitts oscillator, it’s just the capacitors and their values that are different. All I have to say is the circuit is tolerant of my experimenting and is well behaved. Now if only I could get my regenerative receivers to work, so I can receive what the oscillator is putting out. Update May 13 – I left the circuit running on the shelf for most of the week, and it has drifted upwards a few kHz during that time. Not any fast changes, just a slow movement upwards, possibly due to temperature change. This is long term, so if I used it over a period of a few hours, the drift would be less than a hundred Hz. One problem that this has is it’s sensitive to handling, so making changes to the trimmer capacitors takes a lot of trial and error. I could put the varicap back on it, but I’ve read that it can cause some problems. But it has the advantage that I can run a few feet of wire from the circuit to a pot, so I can adjust the frequency without coming near the circuit. I also thought about adding a thermistor to the pot to correct for temperature changes. But I don’t think it really needs it. What I need is to amplitude modulate the carrier with a tone so I can use it for experimenting on the regen receivers. 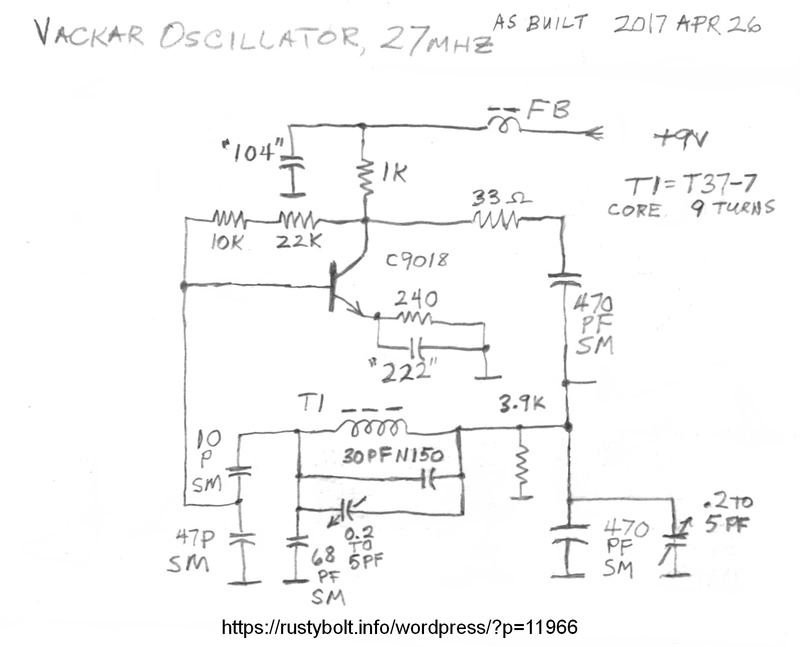 Update May 20 – I made several important changes to the circuit. I changed the capacitor connected to the 33 ohm resistor from 470 pF to 1000 pF. This is a DC blocking capacitor and has very little effect on the frequency. Removed the 30 pF N150 and 5 pF variable from across the coil. There are no more capacitors in parallel with the toroid coil. I changed the 68 pF SM to 100 C0G. I put the 30 pF N150 in parallel with the 470 pF on right side of the coil. The frequency was still too high so I added two of the 0.2 to 5 pF from the left side of the coil to ground. One is at max 5 pF, the other is part way. I calculated the effective capacitance of the parallel tuned circuit and found the left side of the coil has appx 118 pF. The right side of the coil has appx 502 pF. The equivalent capacitance across the coil is 94.4 pF, the frequency is 27.145 MHz, and the XL = XC = 62 ohms. The coil calculated to be 364 nH, which agrees with measurements. I completely understand the frustration with frequency drift I have several expensive generators (tektronix,HP etc.) and Can’t trust any of them so I built a pll ckt and put in a metal cookie box my wife had in the kitchen and it is more stable than any of the $2000 units from the major companies. another option is find an old CB and gut it. the old units are cheap and work great as a stable sig gen.